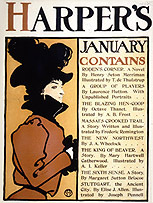 [Poster for Harper’s New Monthly Magazine, Jan 1898]. Woman in hat in left panel, table of contents in right panel. Three-color lithograph and letterpress: yellow, vermilion and black. New York: Harper & Brothers, published Dec 1897. Inscribed near center botttom: bull’s head logo. 14" w. x 18 5/8" h.
Ref: DFP, 386; Lauder, 206; Brandt, 75. 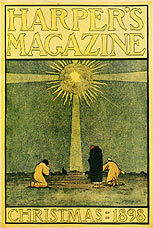 [Poster for Harper’s New Monthly Magazine, Feb 1898]. Man seated on stool, reading in front of fireplace, with cat in foreground. Three-color lithograph: orange, green and black. New York: Harper & Brothers, published Jan 1898. Signed top left: EP stencil monogram. 13 1/4" w. x 19" h.
Ref: DFP, 387; Gibson, 27; Wong, 73; Lauder 207. 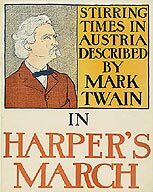 [Poster for Harper’s New Monthly Magazine, Mar 1898]. Portrait of Mark Twain in left panel, type in right. Three-color lithograph: yellow, vermilion and black. New York: Harper & Brothers, published Feb 1898. Unsigned. 12 1/2" w. x 15 5/8" h.
Ref: DFP: 388; Lauder, 208. [Poster for Harper’s New Monthly Magazine, Apr 1898]. Man in foreground playing golf. Four-color lithograph: yellow, vermilion, blue and black. New York: Harper & Brothers, published Mar 1898. Unsigned. 9 5/8" w. x 16 1/8" h.
Design also used on cover art for W.G. Van Tassel Sutphen’s The Golficide and other tales of the fair green (New York, Harper & Brothers, 1898). Lauder, pg 158. Ref: DFP, 389; Wong, 74; Lauder, 209, PAI-16xx, 110; PAI-27, 558. [Poster for Harper’s New Monthly Magazine, May 1898]. Two roosters in field. Three-color lithograph: yellow, vermilion and blue. New York: Harper & Brothers, published Apr 1898. Inscribed bottom left: bull’s head logo. 9 9/16" w. x 16 1/8" h.
Ref: DFP, 390; Gibson, pg 27; Lauder, 210. [o.p.f. Harper’s New Monthly Magazine, May 1898, A 63].Pencil, pen and ink with spatter, and china white on paper, 1898. Inscribed bottom left: bull’s head logo. 9 1/2" w. x 16 1/2" h.
Ref: Gibson, 9; original in print collection of New York Public Library, Astor, Lenox and Tilden Foundations. [Poster for Harper’s New Monthly Magazine, Jun 1898]. Woman riding horse side-saddle. Three-color lithograph: blue, yellow and vermilion. New York: Harper & Brothers, published May 1898. Inscribed lower left: bull’s head logo. 16 1/16" w. x 9 3/8" h.
Ref: DFP, 391; Lauder, 211. [Poster for Harper’s New Monthly Magazine, Jul 1898]. Two cats facing a small potted tree. Three-color lithograph: orange, green and black. New York: Harper & Brothers, published Jun 1898. Inscribed bottom center on planter: bull’s head logo. 14 7/8" w. x 9 3/8" h.
Ref: DFP, 392; Gibson, pg 27; Lauder, 212; Swann-1887, 305. 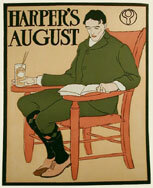 [Poster for Harper’s New Monthly Magazine, Aug 1898]. Man in green suit with lemonade, reading in chair. 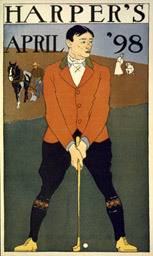 Four-color lithograph: yellow, warm red, dark green and black. New York: Harper & Brothers, published Jul 1898. Inscribed upper right: bull’s head logo. 10 3/8" w. x 13" h.
Ref: DFP, 393; Gibson, pg 27; Lauder, 213; PAI-16, 416. 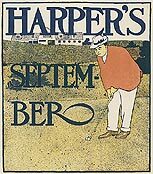 [Poster for Harper’s New Monthly Magazine, Sep 1898]. Golfer putting, clubhouse in background. Three-color lithograph: yellow, red and blue. New York: Harper & Brothers, published Aug 1898. Unsigned. 11 15/16" w. x 13 5/8" h.
Ref: DFP, 394; Gibson, pg 27; Lauder 214; Swann-1941, 358. 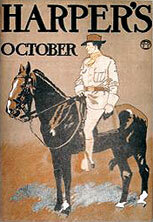 [Poster for Harper’s New Monthly Magazine, Oct 1898]. Mounted soldier. Three-color lithograph: yellow, grey and black. New York: Harper & Brothers, published Sep 1898. Inscribed upper right: bull’s head logo. 11 13/16" w. x 16 15/16" h.
Ref: DFP, 395; Lauder, 215. [Poster for Harper’s New Monthly Magazine, Nov 1898]. Woman and her daughter climb into a waiting cab. Three-color lithograph: yellow, steel grey and black. New York: Harper & Brothers, published Oct 1898. Inscribed bottom left: bull’s head logo. 18 5/8" w. x 11 5/8" h.
Ref: DFP, 396; Lauder, 216. 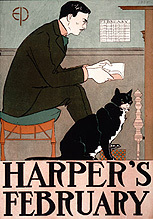 [Poster for Harper’s New Monthly Magazine, Dec 1898], designed by Harvey Ellis. Three wise men behold the star of Bethlehem. Four-color lithograph: yellow, red, blue and black. New York: Harper & Brothers, published Nov 1898. Signed lower left: HARVEY ELLIS. 11 1/8" w. x 16 1/2" h.
Although this poster was not designed by Penfield, its artist, Harvey Ellis, most certainly worked under his art direction. Ellis was trained as an architect, and designed furniture in the arts and crafts style for Stickley. He was also an itinerate alcoholic, prone to fits of depression. Ref: DFP, 222; Lauder, 70.